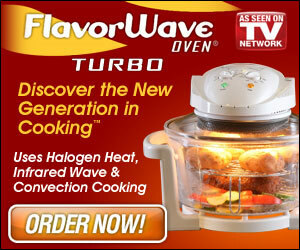 The Flavorwave Turbo Oven helps you cook twice as fast and makes food taste better! Discover the new generation in cooking with the Flavorwave Turbo Oven. It uses halogen heat, infrared wave and convection cooking to help seal juices and enhance natural flavors. Whether the food is fresh or frozn, the Flavorwave Oven does it all. It can bake, broil, roast, toast, grill steam, borwn fry, re-heat and more! Get a free 5-in-1 Slicer as a bonus with your purchase today!